Shetland is blessed with stunning scenery, abundant wildlife and a rich heritage of folklore, music and creativity. Whatever your interests – outdoor pursuits, music, history, archaeology, craft- you will find much to captivate and enjoy here. The islands are easy to explore and taking a turn off the main routes can lead to some of the best views and great opportunities for walking and encountering nature. Shetland.org gives a comprehensive guide to the wide range of activities and attractions which you can enjoy during your stay in Shetland, and to various seasonal events which may interest you. The suggestions below are some of our favourite things to do here and we hope they get you thinking about planning your perfect Shetland holiday. ENJOY THE OUTDOORS | Whatever the weather it is great to get outside and enjoy the clear air, fresh breeze and beautiful surroundings. You have great freedom to walk in Shetland – just dress for the weather, be careful near cliff edges (they can come up on you suddenly) and remember to close any gates and use stiles where possible. A visit to the Hams at the back of Muckle Roe is a must – scroll to the bottom of the page for directions and some other shorter walks on the island. We also love going to Eshaness – take a walk at Stenness to see the Dore Holm, visit the old cemetery to find an interesting grave stone and then go to the lighthouse to see the impressive cliffs. Nibon, at the end of the windy Gunnister road (turn off 5 miles north of Brae) is a beautiful place. Each community has well serviced play parks – Brae Primary School is great and can be accessed outside school hours. ENCOUNTER WILDLIFE | Wherever you are in Shetland you will find wildlife of some sort. From the Chapel you can regularly spot seals, sea birds including cormorants, arctic terns and arctic skuas, wild geese and porpoises. If you watch carefully you may spot an otter going up and down the burn close to the chapel. In the summer you will hear the chatter of the artic terns as they nest on Croga Holm, by the Muckle Roe bridge. Sumburgh Head is a great place for puffin-spotting. A trip to Mousa, one of Shetland’s four RSPB reserves, is a great opportunity to see a wide variety of wildlife. Shetland Nature offer guided tours specialising in Shetland’s unique wildlife. EXPLORE HERITAGE AND CULTURE | the Shetland Museum in Lerwick is a great place to find out more about Shetland’s history. A trip to the Scalloway Museum can be combined with a visit to Scalloway Castle. Bod of Gremista in Lerwick hosts an interesting textile and knitting exhibition. Bonhoga Gallery in the lovely Kergord valley, near Weisdale, houses changing exhibitions throughout the year. The nearby Community Garden is a great place to stop for a picnic. TAKE TO THE SEA | Take the opportunity to see Shetland from the sea. The coastline of Muckle Roe is spectacular viewed from the water, with stacks and caves, and birdlife galore. Muckle Roe Sailing Charters offers a hands on sailing experience from Brae Marina. 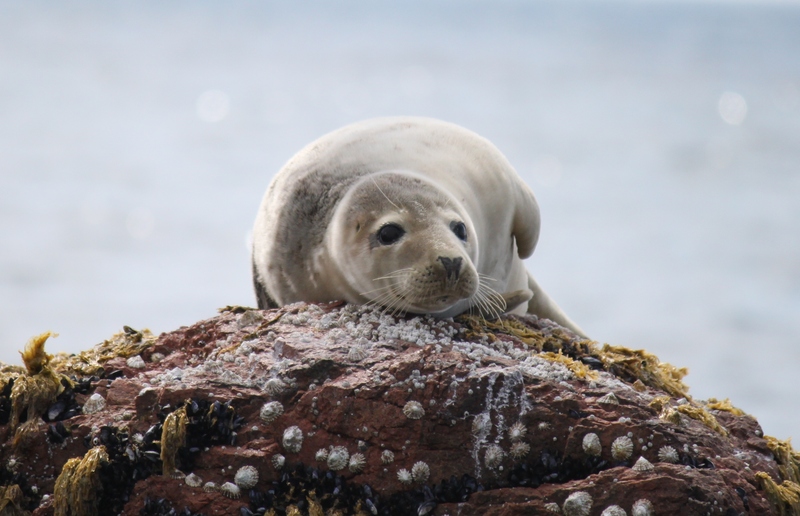 Shetland Marine Charters offer sightseeing or sea angling charters, also from Brae marina. The Shetland coastline is great for sea kayaking and Shetland Kayaking do organised trips. EATING OUT | Frankies, the 2015 UK Fish and Chip Shop of the year, is in nearby Brae and is not to be missed. Breiwick Cafe is a great place to stop off while exploring Eshaness, about 15 miles from the chapel. For a more formal meal the Scalloway Hotel comes highly recommended. 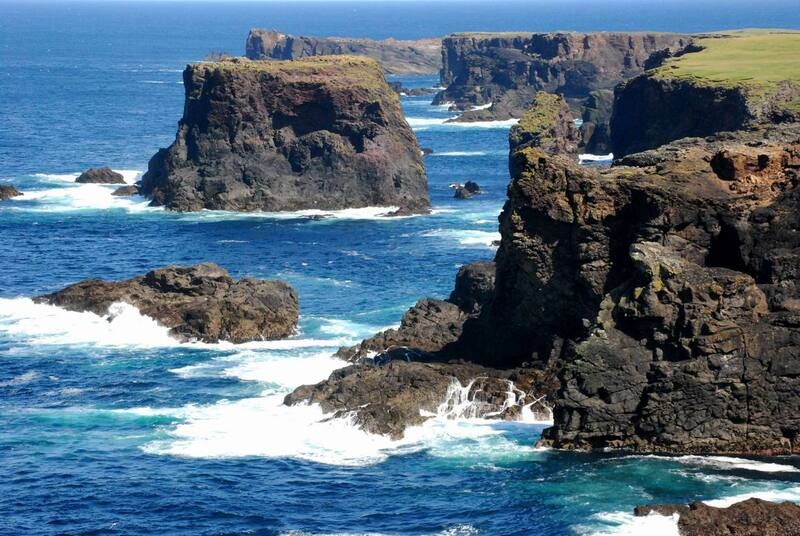 Walk to The Hams – the Hams and Bjorg area of Muckle Roe is well renowned for its beauty. A rough track leaves the public road at the Cumle at the south end of the isle and carries on three miles through the hills, before emerging on the northwest side of the isle among the impressive red granite cliffs and encircled water inlets (Hams). The Hams can also be enjoyed as part of a 12 mile circular walk of the whole island. The incredible coastline with stacks and caves make this an ideal location for kayaking. Walk to Ottister beach at the north end of the island – accessed by a track from the road end at Stabness this beach is part sand part pebble and offers a beautiful view out towards Eshaness and the Drongs (stacks off the Ness of Hillswick). Climb the Ward hill at the centre of Muckle Roe. This can be accessed from the track which leaves the public road at the South Scord at the north end of the island. Explore the very pretty Burn of Scarvataing, following the road up to the Cemetry from the public road ½ mile on from the Chapel. The burn can be followed up to its source at the Loch o’ da Boddams, where you can watch the young trout. Play at the Muckle Ayre beach, a short walk down from the end of the road at the South end of the isle. Explore up the burn which runs down through the beach. Walk on from the Muckle Ayre beach, past the next inlet, Birkie Ayre, and follow the track to the beacon, which replaced the Muckle Roe lighthouse. Watch the seals playing by the Murbie Stacks.